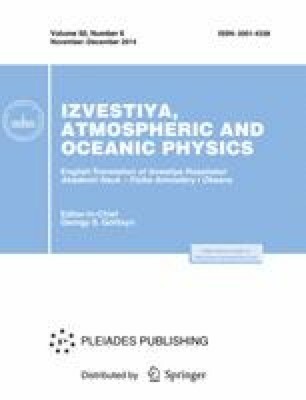 The data on measurements of carbon dioxide concentrations in the near-surface air in the territory of the European part of Russia using Fourier transform spectroscopy are presented. Analysis of these data showed that temporal variations in CO2 concentrations included ∼18% of relatively high, short-lived concentrations that appear during temperature inversions and fires. The measurement results are separated into the regional natural background CO2 concentration and the anthropogenic admixture. The seasonal component is distinguished in the background CO2 concentration. The maxima and minima of seasonal CO2 variations fall most often within February and July, respectively, at an average amplitude of 20.2 ± 3.8 ppm. The coefficient of pair correlation between seasonal CO2 concentrations and temperature is −0.85. Spectral analysis revealed a large number of composite oscillations of the background CO2 concentration, from 2 to 126 months in period. A simple model using the parameters of these oscillations describes the temporal variations in background CO2 concentration with an error of less than 1%. The anthropogenic admixture of CO2 into the atmosphere consists of a random component and a long-term trend. For 13 years of observations, the anthropogenic admixture was ∼33 ppm at an average growth rate of ∼2.04 ppm/yr. Original Russian Text © V.N. Aref’ev, N.Ye. Kamenogradsky, F.V. Kashin, A.V. Shilkin, 2014, published in Izvestiya AN. Fizika Atmosfery i Okeana, 2014, Vol. 50, No. 6, pp. 655–662.